Post-secondary educational institutions have incorporated tablets in the educational curriculum (Woodford, 2001). To investigate how reading medium impacts critical reading ability, I performed two studies. In the first study, participants read an SAT practice test passage (Mathur, 2012) from either paper or an iPad 2 tablet. The identical passages were 949 words. Once the reading was complete, participants responded to 12 critical reading assessment questions about the passage. 116 participants completed the critical reading assessment study. A second study, a self-response survey, which examined the reading preferences and demographics (gender and age) of 115 participants was also conducted. A two-way ANOVA was used to analyze the results of the critical reading comprehension test. No significant difference was found between critical reading comprehension scores between mediums and academic standing (p = .911). The self-response survey was assessed using a chi-square analysis. There was no significant difference in preference between upper and lower division undergraduates (p = .157). Females showed a stronger preference for reading from paper than males (p = .045), and a significant preference was found among the total sample population for reading from paper over other surveyed forms of media (p < 0.001). The implications of this study are relevant to the future of education and sustainability efforts in the classroom. Does reading medium affect critical reading ability when an individual reads from screen vs. from paper? iPads, iPad 2, and other tablet computers are popular. Apple released the iPad April 3, 2010. Within 80 days of the release 300,000 units had been sold. Apple sold 32 million iPads in the 2011 fiscal year (Lowensohn, 2011). There has also been a push to integrate tablet technology into the classroom (Woodford, 2011). Tablet computers moving into the classroom setting is a natural progression, especially considering the widespread use of laptop computers and cell phones in today's society. Personal computers are already prevalent in Universities with 97.5 percent of university students reporting they own a personal laptop (Kaplan, 2011). Class technology, such as Classroom Presenter, has been shown to increase classroom participation and focus (Koile & Singer, 2006). In August 2011, Yale school of medicine gave 520 students an iPad 2 in an effort to save money by cutting down on paper, books, and issues transporting information (Woodford, 2011). Because they are a relatively new technology, little research has been conducted into critical reading ability on these devices and the movement of the tablet into the classroom. There are conflicting results regarding reading comprehension and reading speed in relation to the text medium presented. Oborne and Holton (1988) tested reading comprehension, comparing distance from screen, angle of the paper or screen, and light text on a dark background versus dark text on a light background. Participant's reading comprehension was evaluated along with time taken to read the four passages from short stories written by H.H. Munro. Oborne and Holton (1988) found no significant difference in reading comprehension when comparing screen versus paper. However, considering the change in technology and quality of screen and text presentation available today, it is reasonable to suggest results may differ if the study were replicated with modern technology. Kruk and Muter (1984) found university students read slower from a video screen than from books. Researchers placed participants at varying distances from the screen and altered line spacing. Neither of these conditions accounted for the significant difference in reading speed between video screen and from paper (Kruk & Muter, 1984). These conflicting results beg the question: does an actual difference exist? If so, is the difference enough to hinder or encourage the integration of tablet computer technology into the modern classroom? In a study by Holzinger, Baernthaler, Pammer, Kratz, Bjelic-Radisc, and Ziefle (2011), 111 Austrian clinicians read two separate reports, one from paper and one from of a computer screen. Clinicians performed equally well on a chunked reading evaluation of the two separate reports in the two separate mediums. The Austrian doctors stated a 90 percent preference for reports read on paper versus on a high-resolution screen, however there was no significant difference in reading comprehension (Holzinger et al., 2011). Participants reported preferred paper because of it's flexibility, durability, portability and their ability to take notes on the paper itself simply and efficiently (Holzinger et al. 2011). Ball and Horcade (2012) found that reading speed and comprehension increase with age, regardless of reading medium. Two groups were involved in testing critical reading ability. One group read a text passage from paper, while the other group read the same text passage from an iPad 2. A 12-question critical reading evaluation was given to assess critical reading differences as influenced by text medium, academic standing, and review for interactive effects. The general lack of consistency in study results, as well as the amount of time that has passed between studies (Kruk & Muter, 1984 & Holzinger et al. 2011) begs the question: Is there a difference in critical reading scores between mediums. If so, should there be an integration of tablet computers into the classroom? The purpose of the current study is to establish whether there is a difference in critical reading ability between mediums; and if this does exist, does the comprehension gap differ by academic standing (e.g., freshman)? My prediction, based on previous research, is that there will be a statistically significant difference in between mediums in favor of paper and that difference expands as the age of the participant increases. 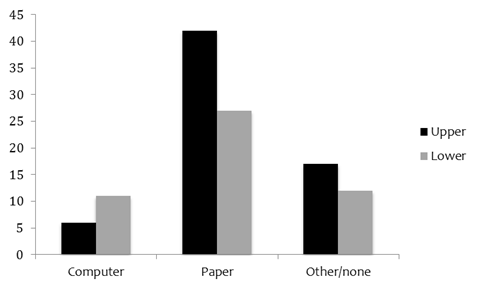 Further, I predict the preference for paper rather than computer screen will increase with the age of the participant. Because of the lack of consistency concerning reading comprehension studies and the effects of medium as related to both comprehension and preference, two studies were performed. The first study was a critical reading assessment based on a 949 word reading passage. The second was a self-assessment of preference and reading habits. The goal of this study was to assess differences in critical reading scores comparing scores produced from reading from iPad 2 tablet screens and paper. Participant academic standing was collected to assess whether familiarity with computer screens and exposure to literature impact critical reading ability. 116 Sierra Nevada College undergraduate students were randomly assigned to one of four groups categorized by text medium and academic standing: (a) lower classmen reading from paper, (b) lower classmen reading from a tablet, (c) upper classmen reading from paper, (d) upper classmen reading from a tablet. Participants were presented a portion of a text titled The Mayor of Casterbridge by Thomas Hardy (Mathur, 2010). In the paper condition, the passage was presented on OfficeMax 50% recycled multipurpose paper (92 bright, 75 gsm, 216 mm x 279 mm) with 2.54 cm margins. In the iPad condition, the participants were presented with the text on a 64 gb, Apple iPad 2. The document was presented in the "Pages" application. "Pages" is a word processing application used for reading and editing documents. The iPad screen was 197 x 148 mm. Participants were presented a passage from The Mayor of Casterbridge by Thomas Hardy (Mathur, 2010) (see Appendix A for reading Material). The passage consisted of 949 words. For the screen condition, the font used was Helvetica (13 pt font). The paper version of the reading was an identical, printed version of the computer screen reading condition to be sure then line breaks and words on each line are the same. Participants were randomly assigned a condition, either paper or screen, using a random number generator. Upon entering the testing room, the participant was greeted and given a description of the informed consent form outlining the confidentiality and protection of information, procedures and responsibilities of the experimenter. It was clarified that participants were not obligated to participate. After completing the consent document, participants were provided their randomly assigned reading materials. They were asked to read the passage with no time restriction. After participants indicated they were finished reading the passage, they were presented a critical reading ability test (see Appendix C for questionnaire) in the same medium their text passage was presented. If the participant read the passage on paper, their comprehension test was also presented on paper and answered with a pen. Likewise, if the participant read the passage on the iPad 2 tablet computer, the comprehension test was also presented and completed on the iPad 2 tablet computer. The second study assessed whether there was a preference among 112 Sierra Nevada College undergraduate students for reading from paper vs. from iPad 2 screens. It also assessed the academic standing, gender, and reading habits of the participants. The second study, a self-response survey, was administered once the comprehension test was complete. Participants were handed a brief questionnaire about their age and academic standing. Questionnaires for participants in both conditions were presented on paper and answered with a pencil (See Appendix D for questionnaire). Upon completion of the questionnaire, participants were thanked for their participation and debriefed. During the debriefing session, participants were informed that they could request an email outlining the details of the study. 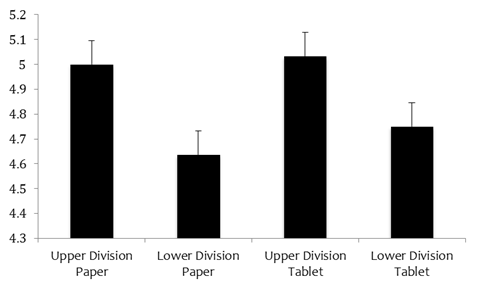 The critical reading ability differences between tablet screens and paper were scored based on the number of correct responses provided by participants. The scoring scale ranged from 0 – 12 using the SAT critical reading evaluation (Mathur, 2010). The two factors (text medium and academic standing) were assessed using a two-way ANOVA test (α = .05); this compared the interactive effects between book and tablet critical reading ability as well as the academic standing of the participants. There were no significant differences when comparing critical reading scores between the iPad 2 and paper (p = .841) or when comparing upper and lower division undergraduates and their critical reading ability (p = .375). The analysis of any interactive effects using the general linear model showed no significant differences (p = .911). Figure 1. Two-way ANOVA produced no significant difference among participant academic standing and critical reading scores (p = .375), reading medium and critical reading scores (p = .841) or interactive effects (p = .911). Evaluation of the self-response surveys concerning academic standing and reading preference were evaluated using a chi-square test of independence (α = .05) as well as a goodness of fit test to assess statistically significant differences among groups and preferences. A statistically significant difference was found when assessing the preferences of the entire sample population. There was strong statistical evidence to support the alternative hypothesis that there was a preference for reading from paper relative to a computer screen (p < .001)*. There was no significant difference found when analyzing the preferences of upper and lower division undergraduates (p = .157). A significant difference was found when comparing the reading preferences of males and females. It was found that females have a stronger preference for reading from paper than males (p = .045)*. Figure 3. Chi-square test of independence showed a significant difference for females preferring paper over males (p = .045)*. Figure 4. 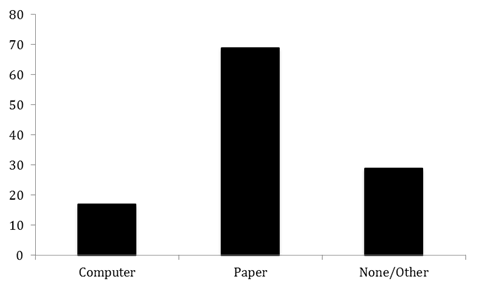 Chi-square goodness of fit test showed a significant preference for paper across the test population (n = 112) (p < .001)*. The findings of the two-way ANOVA failed to reject the null hypothesis that there is a difference in critical reading scores between mediums and support the null hypothesis that there is no difference in critical reading ability when comparing reading from an iPad 2 tablet computer and paper. 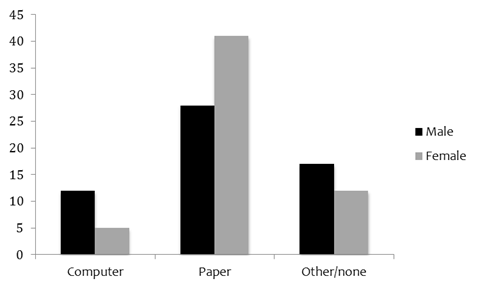 Additionally this study's findings indicated a strong preference for reading from paper rather than computer screen. Although there is no difference in reading comprehension scores between mediums, preference plays a large role in willingness to attend to a particular task. Post secondary educational institutions have already begun integrating iPads into their curriculum in an effort to reduce textbook costs and create a more sustainable educational system (Woodford, 2011). Because there was such strong evidence shown that medium does not influence critical reading ability, there is a strong case made for the implementation of iPads into the college curriculum, if for no other reason than a long-term attempt to save book costs for both the students and the institution itself. This finding falls in line with those of Holzinger et al. (2011) who found reading comprehension was unaffected by computer screens, but there was an overwhelming preference for reading from paper, rather than computer screen. Ball and Hourcade, (2011) found a difference in reading ability by age. The current study did not find that to be the case, especially across mediums. In an attempt to control for outliers and confounding variables, participants were randomly assigned the reading medium (tablet vs. paper). The findings of this study could, alternatively, be due to familiarity with iPads and other handheld electronic devices. This exposure was not taken into account. There were also no precautions taken to rule out the influence of learning disabilities such as dyslexia that could have altered the outcome. Further research could assess the potential for newer technology in the field and ink based screens that may affect critical reading ability. The passage and questions used may not be the ideal material for assessing critical reading ability and future research could address the relevance of the length, content, and analysis of critical reading scores when assessing technology and its relation to written language comprehension. Critical reading analysis is an essential component at any level of education. There is strong evidence to support the claim there is no difference when comparing critical reading scores from an iPad 2 tablet and paper. This supports the movement toward a more technologically based curriculum. Books are still an essential part of both education and daily life. A preference for reading from paper, rather than iPads or other forms of media is present within the education community. This means that, although there is no difference in reading performance between mediums, there will likely always be a place for paper within the curriculum. Some stated preferences for paper because they felt it was easier on the eyes, more convenient, and easier to work with in general. As technology improves, these problems may become less relevant. Currently, paper is still an important part of the education system. As tablet technology progresses, the production process for iPads and tablet computers is likely to become more sustainable and the processes involved in recycling iPads more practical. By switching the course curriculum and reading lists to tablet computers, we are could offset the cost of a post-secondary education and support sustainable practices at the same time, thereby making education more affordable to a population who otherwise might not have access. Ball, R., & Hourcade, J. P. (2011). Rethinking reading for age from paper and computers. International Journal of Human-Computer Interaction, 27(11), 1066-1082. Holzinger, A., Baernthaler, M., Pammer, W., Kratz, H., Bjelic-Radisic, V., & Ziefle, M. (2011). Investigating paper vs. screen in real-life hospital workflows: Performance contradicts perceived superiority of paper in the user experience. International Journal of Human-Computer Studies, 69(9), 563-570. Koile, K. & Singer, D. (2006). Improving learning in cs1 via tablet-pc-based in-class assessment. ICER '06: Proceedings of the 2006 international workshop on Computing education research, 119–126. Kruk, R. S., & Muter, P. (1984). Reading of continuous text on video screens. Human Factors, 26, 339-345. Oborne, D., & Holton, D. (1988). Reading from screen versus paper: There is no difference. International Journal of Machine Studies, 28(1), 1-9. The Ring at Casterbridge was merely the local name of one of the finest Roman Amphitheatres, if not the very finest, remaining in Britain. Casterbridge announced old Rome in every street, alley, and precinct. It looked Roman, bespoke the art of Rome, concealed dead men of Rome. It was impossible to dig more than a foot or two deep about the town fields and gardens without coming upon some tall soldier or other of the Empire, who had lain there in his silent unobtrusive rest for a space of fifteen hundred years. He was mostly found lying on his side, in an oval scoop in the chalk, like a chicken in its shell; his knees drawn up to his chest; sometimes with the remains of his spear against his arm, a fibula or brooch of bronze on his breast or forehead, an urn at his knees, a jar at his throat, a bottle at his mouth; and mystified conjecture pouring down upon him from the eyes of Casterbridge street boys and men, who had turned a moment to gaze at the familiar spectacle as they passed by. Imaginative inhabitants, who would have felt an unpleasantness at the discovery of a comparatively modern skeleton in their gardens, were quite unmoved by these hoary shapes. They had lived so long ago, their time was so unlike the present, their hopes and motives were so widely removed from ours, that between them and the living there seemed to stretch a gulf too wide for even a spirit to pass. The Amphitheatre was a huge circular enclosure, with a notch at opposite extremities of its diameter north and south. From its sloping internal form it might have been called the spittoon of the Jotuns. It was to Casterbridge what the ruined Coliseum is to modern Rome, and was nearly of the same magnitude. The dusk of evening was the proper hour at which a true impression of this suggestive place could be received. Standing in the middle of the arena at that time there by degrees became apparent its real vastness, which a cursory view from the summit at noon-day was apt to obscure. Melancholy, impressive, lonely, yet accessible from every part of the town, the historic circle was the frequent spot for appointments of a furtive kind. Intrigues were arranged there; tentative meetings were there experimented after divisions and feuds. But one kind of appointment—in itself the most common of any—seldom had place in the Amphitheatre: that of happy lovers. Why, seeing that it was pre-eminently an airy, accessible, and sequestered spot for interviews, the cheerfullest form of those occurrences never took kindly to the soil of the ruin, would be a curious inquiry. Perhaps it was because its associations had about them something sinister. Its history proved that. Apart from the sanguinary nature of the games originally played therein, such incidents attached to its past as these: that for scores of years the town-gallows had stood at one corner; that in 1705 a woman who had murdered her husband was half-strangled and then burnt there in the presence of ten thousand spectators. Tradition reports that at a certain stage of the burning her heart burst and leapt out of her body, to the terror of them all, and that not one of those ten thousand people ever cared particularly for hot roast after that. In addition to these old tragedies, pugilistic encounters almost to the death had come off down to recent dates in that secluded arena, entirely invisible to the outside world save by climbing to the top of the enclosure, which few towns-people in the daily round of their lives ever took the trouble to do. So that, though close to the turnpike-road, crimes might be perpetrated there unseen at mid-day. Some boys had latterly tried to impart gaiety to the ruin by using the central arena as a cricket-ground. But the game usually languished for the aforesaid reason—the dismal privacy which the earthen circle enforced, shutting out every appreciative passer's vision, every commendatory remark from outsiders—everything, except the sky; and to play at games in such circumstances was like acting to an empty house. Possibly, too, the boys were timid, for some old people said that at certain moments in the summer time, in broad daylight, persons sitting with a book or dozing in the arena had, on lifting their eyes, beheld the slopes lined with a gazing legion of Hadrian's soldiery as if watching the gladiatorial combat; and had heard the roar of their excited voices, that the scene would remain but a moment, like a lightning flash, and then disappear. It was related that there still remained under the south entrance excavated cells for the reception of the wild animals and athletes who took part in the games. The arena was still smooth and circular, as if used for its original purpose not so very long ago. The sloping pathways by which spectators had ascended to their seats were pathways yet. But the whole was grown over with grass, which now, at the end of summer, was bearded with withered bents that formed waves under the brush of the wind, returning to the attentive ear aeolian modulations, and detaining for moments the flying globes of thistledown. Henchard had chosen this spot as being the safest from observation which he could think of for meeting his long-lost wife, and at the same time as one easily to be found by a stranger after nightfall. As Mayor of the town, with a reputation to keep up, he could not invite her to come to his house till some definite course had been decided on. Brief script the experimenter is to follow when administering the experiment. Experimenter: Hello, thanks for coming. Experimenter invites participant to sit down and explains the IRB consent form and makes sure the participant understands that he or she is allowed to leave at any time and is in no way obligated to participate in the study. Experimenter: Please read this passage and let me know when you've finished (hand out both media types). When participants indicate they have finished the reading, they are given the questions. Experimenter: please answer these questions to the best of your abilities and let me know when you are finished. *iPad participants are shown how to indicate their answer on the iPad screen. When participant indicates they have finished answering the Critical Reading Ability questions, they are handed the Self-Response survey and asked to complete it. Experimenter: Thank you very much for your participation. If you leave me your email, I can let you know the importance of your participation in the study. A. its real size could not be appreciated at a glance. E. it was best appreciated in the evening. Reading preference questionnaire given to participants. 1. What is your preferred media form to use when reading? 2. How often do you read for pleasure? 3. If you indicated you have a preferred media form to read, why do you prefer that form of media? 4. In an average day what form of media do you use to read most often?